Looking to add a splash of color to your landscape design? Want to enjoy stunning views year-round in your outdoor living space? Flower beds could be the finishing touch to a picture-perfect property. To help you come up with flower bed ideas that are inspiring and unique, we’ve come up with some key components to think about through the planning stages of your project. We also offer consultations in the Northern Virginia area, where our designers can assess the scope of your landscape to provide you with more customized suggestions. Give us a call today at 703-533-5001 for service in Great Falls, North Arlington, the City of Falls Church, McLean, or Vienna! The best flower bed ideas for your property vary depending on the scope of your landscape, your desired aesthetic, and your budget. Consider your maintenance requirements as well—certain plantings require more care than others to sustain the look that drew you to them in the first place. Placement – will your flower beds serve as an inviting entry in the front yard? Or a border in the back? 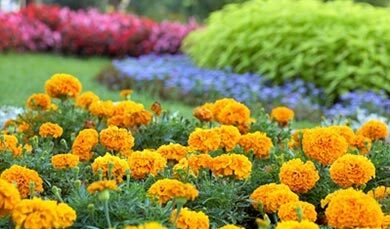 Annuals complete their life cycle in just one growing season, and typically require a great deal of care—primarily watering and fertilization. However, they tend to blend beautifully with other plants, which can make them a great choice in flower beds, and can last longer with routine pruning. Popular types of annuals include Marigolds, Petunias, Pansies, and Geraniums. Biennials have a life cycle that lasts two years. They grow their initial structure in the first season (grow leaves) and continue to seed and flower in the second. Some popular options include Hollyhock and Parsley. Perennials bloom each year so long as they are properly maintained. Some varieties can take a season to grow before blossoming, but will then continue to do so from year to year without having to be replanted. Initial installation costs can be higher than with other plant types, but they pay for themselves in that you don’t have to worry about installing new seeds each year. Bulbs can be planted once and then left to feed themselves during stages of dormancy. They are typically chosen for flowering beautifully and can blossom each year if they are properly maintained. Popular varieties include Tulips, Daffodils, Gladiolus, and Dahlias. Bring your flower bed ideas to life with O’Grady’s Landscape! Whether you have an exact vision of the end result or need more suggestions for plantings that are colorful and easy to maintain, our designers and arborists can offer recommendations to inspire and impress. We can also assist you in transplanting flower beds to give your landscape a new look or provide ongoing maintenance so you can focus on aesthetics, and let us worry about routine care. We serve clients in Great Falls, North Arlington, the City of Falls Church, McLean, and Vienna—call today at 703-533-5001 for an estimate on your project!